도메인 컨트롤러에 게이트웨이를 설치할 수 없습니다.You can't install a gateway on a domain controller. 꺼져 있거나 절전 상태이거나 인터넷에 연결되지 않은 상황에서는 게이트웨이를 실행할 수 없으므로 이러한 상황의 노트북과 같은 컴퓨터에는 게이트웨이를 설치하지 않아야 합니다.You shouldn't install a gateway on a computer, such a laptop, that may be turned off, asleep, or not connected to the Internet because the gateway can't run under any of those circumstances. 또한 무선 네트워크를 통해 게이트웨이 성능이 저하될 수 있습니다.In addition, gateway performance might suffer over a wireless network. 설치 관리자를 다운로드한 후 실행합니다.Download the installer, and then run it. 설치 마법사의 첫 번째 화면에서 다음을 클릭하거나 탭하여 노트북에 게이트웨이를 설치하는 것에 대한 미리 알림을 확인합니다.On the first screen of the installation wizard, click or tap Next to acknowledge the reminder about installing a gateway on a laptop. 사용자 계정 컨트롤 대화 상자에서 예를 클릭하거나 탭하여 계속합니다.In the User Account Control dialog boxes, click or tap Yes to continue. 마법사의 다음 화면에서 로그인을 클릭하거나 탭한 후 PowerApps에 로그인하는 데 사용하는 것과 동일한 자격 증명을 제공합니다.On the next screen of the wizard, click or tap Sign in, and then provide the same credentials that you use to sign in to PowerApps. 새 게이트웨이를 등록하거나 기존 게이트웨이를 마이그레이션, 복원 또는 인수하는 옵션을 클릭하거나 탭한 후 다음을 클릭하거나 탭합니다.Click or tap the option to register a new gateway or to migrate, restore, or take over an existing gateway, and then click or tap Next. 게이트웨이를 구성하려면 이름 및 복구 키를 입력하고 구성을 클릭하거나 탭한 후 닫기를 클릭하거나 탭합니다.To configure a gateway, type a name for it and a recovery key, click or tap Configure, and then click or tap Close. 8자 이상을 포함하는 복구 키를 지정하고 안전한 곳에 보관합니다.Specify a recovery key that contains at least eight characters, and keep it in a safe place. 게이트웨이를 마이그레이션, 복원 또는 인수하려는 경우 이 키가 필요합니다.You'll need this key if you want to migrate, restore, or take over its gateway. 기존 게이트웨이를 마이그레이션, 복원 또는 인수하려면 게이트웨이 이름과 복구 키를 입력하고 구성을 클릭하거나 탭한 후 추가 프롬프트를 따릅니다.To migrate, restore, or take over an existing gateway, provide the name of the gateway and its recovery key, click or tap Configure, and then follow any additional prompts. 게이트웨이에 대한 프록시 정보를 제공하는 방법에 대한 자세한 내용은 프록시 설정 구성을 참조하세요.For information about how to provide proxy information for your gateway, see Configure proxy settings. PowerShell 프롬프트에서 다음 명령을 실행하여 방화벽 또는 프록시가 연결을 차단하는지 여부를 확인할 수 있습니다.You can verify whether your firewall, or proxy, may be blocking connections by running the following command from a PowerShell prompt. 이 명령은 Azure Service Bus에 대 한 연결을 테스트합니다.This command will test connectivity to the Azure Service Bus. 이는 네트워크 연결을 테스트하는 데만 사용되며 클라우드 서버 서비스 또는 게이트웨이와 관련이 없습니다.This only tests network connectivity and doesn't have anything to do with the cloud server service or the gateway. 컴퓨터가 실제로 인터넷에 액세스할 수 있는지 여부를 확인하는 데 도움이 됩니다.It helps to determine whether your machine can actually get out to the internet. 결과는 다음 예와 유사해야 합니다.The results should look similar to this example. TcpTestSucceeded가 True가 아니면 방화벽에 의해 차단될 수 있습니다.If TcpTestSucceeded is not True, you may be blocked by a firewall. 완전하게 보려면 ComputerName 및 Port 값을 이 항목 뒷부분에 있는 포트 구성에 나열된 값으로 대체합니다.If you want to be exhaustive, substitute the ComputerName and Port values with those listed under Configure ports later in this topic. 또한 방화벽은 Azure Service Bus가 Azure 데이터 센터에 보내는 연결을 차단할 수도 있습니다.The firewall may also be blocking the connections that the Azure Service Bus makes to the Azure data centers. 이 경우, 해당 데이터 센터에 대해 해당 지역의 IP 주소를 허용 목록에 추가(차단 해제)하고 싶을 것입니다.If that's the case, you'll want to whitelist (unblock) the IP addresses for your region for those data centers. 여기에서 Azure IP 주소 목록을 가져올 수 있습니다.You can get a list of Azure IP addresses here. 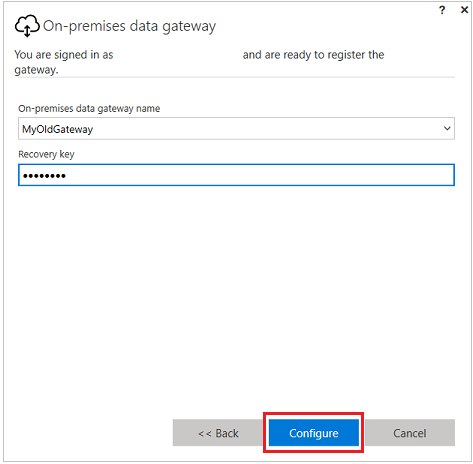 게이트웨이는 Azure Service Bus에 대한 아웃바운드 연결을 만듭니다.The gateway creates an outbound connection to Azure Service Bus. 아웃바운드 포트: TCP 443(기본값), 5671, 5672, 9350~9354에서 통신합니다.It communicates on outbound ports: TCP 443 (default), 5671, 5672, 9350 thru 9354. 게이트웨이에는 인바운드 포트가 필요하지 않습니다.The gateway doesn't require inbound ports. 하이브리드 솔루션에 대해 자세히 알아보세요.Learn more about hybrid solutions. 방화벽에서 데이터 영역에 대한 IP 주소를 허용 목록에 추가하는 것이 좋습니다.It is recommended that you whitelist the IP addresses, for your data region, in your firewall. 매주 업데이트되는 Microsoft Azure 데이터 센터 IP 목록을 다운로드할 수 있습니다.You can download the Microsoft Azure Datacenter IP list, which is updated weekly. Azure 데이터 센터 IP 목록에서 주소는 CIDR 표기법으로 나열됩니다.In the Azure Datacenter IP list, addresses are listed in CIDR notation. 예를 들어 10.0.0.0/24는 10.0.0.0~10.0.0.24를 의미하지 않습니다.For example, 10.0.0.0/24 doesn't mean 10.0.0.0 through 10.0.0.24. 게이트웨이에서 사용되는 정규화된 도메인 이름 목록은 다음과 같습니다.Here is a listing of the fully qualified domain names used by the gateway. *.msftncsi.com*.msftncsi.com 443443 게이트웨이가 Power BI 서비스에서 연결할 수 없는 경우 인터넷 연결을 테스트하는 데 사용됩니다.Used to test internet connectivity if the gateway is unreachable by the Power BI service. 사용자는 회사 또는 학교 계정 중 하나로 로그인합니다.Users will sign in with either a work or school account. 조직 계정입니다.This is your organization account. Office 365 제품에 로그인하였고 실제 직장 전자 메일을 입력하지 않은 경우 nancy@contoso.onmicrosoft.com처럼 보일 수 있습니다.If you signed up for an Office 365 offering and didn’t supply your actual work email, it may look like nancy@contoso.onmicrosoft.com. 클라우드 서비스 내에서 사용자의 계정은 AAD(Azure Active Directory)의 테넌트 내에 저장됩니다.Your account, within a cloud service, is stored within a tenant in Azure Active Directory (AAD). 대부분의 경우 AAD 계정의 UPN은 이메일 주소와 일치합니다.In most cases, your AAD account’s UPN will match the email address. 온-프레미스 데이터 게이트웨이는 Windows 서비스 로그온 자격 증명에 대해 NT SERVICE\PBIEgwService를 사용하도록 구성됩니다.The on-premises data gateway is configured to use NT SERVICE\PBIEgwService for the Windows service logon credential. 기본적으로 서비스로 로그온 권한을 포함합니다.By default, it has the right of Log on as a service. 게이트웨이를 설치 중인 컴퓨터의 컨텍스트에 있습니다.This is in the context of the machine on which you're installing the gateway. 온-프레미스 데이터 원본 또는 클라우드 서비스에 로그인하는 회사 또는 학교 계정에 연결하는 데 사용되는 계정이 아닙니다.This isn't the account used to connect to on-premises data sources or the work or school account with which you sign in to cloud services. 인증으로 인해 프록시 서버에 문제가 발생하면 프록시 구성에서 설명하는대로 Windows 서비스 계정을 도메인 사용자 또는 관리 서비스 계정으로 변경할 수 있습니다.If you encounter issues with your proxy server due to authentication, you may want to change the Windows service account to a domain-user or managed-service account as proxy configuration describes. 테넌트 관리자가 다른 사용자가 설치 및 구성한 모든 게이트웨이를 관리할 수 있는 단일 장소는 없습니다.There is currently no single place where tenant administrators can manage all the gateways that other users have installed and configured. 테넌트 관리자인 경우 설치할 모든 게이트웨이에 관리자로 추가하도록 조직의 사용자에게 요청하는 것이 좋습니다.If you’re a tenant administrator, we recommend that you ask the users in your organization to add you as an administrator to every gateway they install. 이렇게 하면 게이트웨이 설정 페이지를 통해 또는 PowerShell 명령을 통해 조직의 모든 게이트웨이를 관리할 수 있습니다.This allows you to manage all the gateways in your organization through the Gateway Settings page or through PowerShell commands. 질문: 게이트웨이에서 지원하는 데이터 원본은 무엇인가요?Question: What data sources does the gateway support? 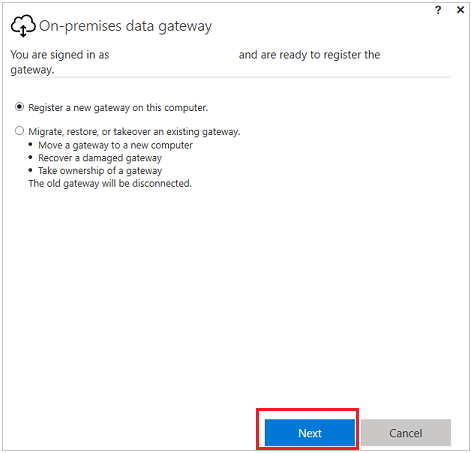 질문: SQL Azure와 같은 클라우드 데이터 원본에는 게이트웨이가 필요한가요?Question: Do I need a gateway for data sources in the cloud, such as SQL Azure? 답변: 아니요.Answer: No. 게이트웨이는 온-프레미스 데이터 원본에만 연결됩니다.A gateway connects to on-premises data sources only. 질문: 실제 Windows 서비스를 어떻게 지칭하나요?Question: What is the actual Windows service called? 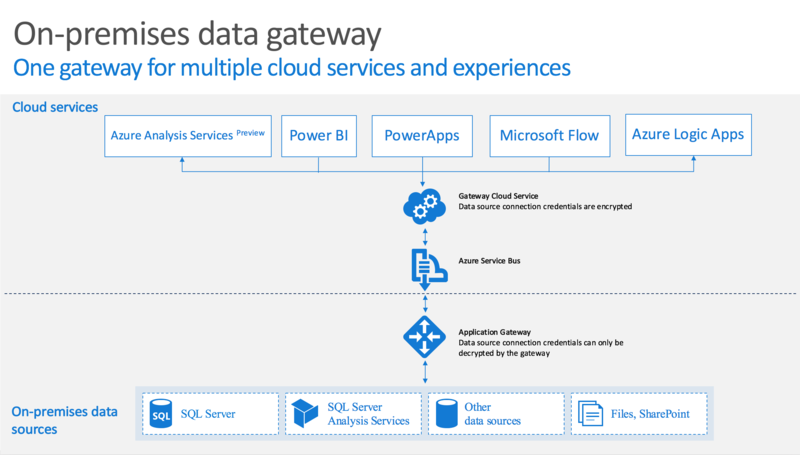 답변: 서비스에서는 게이트웨이를 Power BI Enterprise Gateway Service라고 합니다.Answer: In Services, the gateway is called Power BI Enterprise Gateway Service. 질문: 클라우드에서 게이트웨이로의 인바운드 연결이 있나요?Question: Are there any inbound connections to the gateway from the cloud? 답변: 아니요.Answer: No. 게이트웨이는 Azure Service Bus로 아웃바운드 연결을 사용합니다.The gateway uses outbound connections to Azure Service Bus. 질문: 아웃바운드 연결이 차단되면 어떻게 되나요?Question: What if I block outbound connections? 어떻게 해야 하나요?What do I need to open? 답변: 위에서 게이트웨이에 사용된 포트 및 호스트 목록을 참조하세요.Answer: Refer to the list of ports and hosts that the gateway uses above. 질문: 게이트웨이를 데이터 원본과 동일한 컴퓨터에 설치해야 하나요?Question: Does the gateway have to be installed on the same machine as the data source? 답변: 아니요.Answer: No. 게이트웨이는 제공된 연결 정보를 사용하여 데이터 원본에 연결합니다.The gateway will connect to the data source using the connection information that was provided. 이 의미에서 게이트웨이를 클라이언트 응용 프로그램으로 생각합니다.Think of the gateway as a client application in this sense. 제공된 서버 이름에만 연결할 수 있어야 합니다.It will just need to be able to connect to the server name that was provided. 질문: 게이트웨이에서 데이터 원본으로 쿼리를 실행하기 위한 대기 시간이란 무엇인가요?Question: What is the latency for running queries to a data source from the gateway? 최상의 아키텍처는 무엇인가요?What is the best architecture? 답변: 네트워크 대기 시간을 줄이기 위해 가능한 데이터 원본에 가깝도록 게이트웨이 설치합니다.Answer: To reduce network latency, install the gateway as close to the data source as possible. 실제 데이터 원본에 게이트웨이를 설치할 수 있는 경우 발생하는 대기 시간이 최소화됩니다.If you can install the gateway on the actual data source, it will minimize the latency introduced. 데이터 센터도 고려해야 합니다.Consider the data centers as well. 예를 들어 서비스가 미국 서부 데이터 센터를 사용하고 Azure VM에서 호스팅되는 SQL Server가 있다면 미국 서부에도 Azure VM이 있어야 합니다.For example, if your service is using the West US data center and you have SQL Server hosted in an Azure VM, you'll want to have the Azure VM in West US as well. 이렇게 하면 대기 시간이 최소화되고 Azure VM에서 송신 요금을 피할 수 있습니다.This will minimize latency and avoid egress charges on the Azure VM. 질문: 네트워크 대역폭에 대한 요구 사항이 있나요?Question: Are there any requirements for network bandwidth? 답변: 네트워크 연결에 대한 양호한 처리량을 갖는 것이 좋습니다.Answer: It is recommended to have good throughput for your network connection. 각 환경이 다르며 전송되는 데이터 양은 결과에 영향을 줍니다.Every environment is different, and the amount of data being sent will affect the results. ExpressRoute를 사용하면 온-프레미스와 Azure 데이터 센터 간에 처리량 수준을 보장하는 데 도움이 될 수 있습니다.Using ExpressRoute could help to guarantee a level of throughput between on-premises and the Azure data centers. 타사 도구인 Azure 속도 테스트 앱을 사용하여 처리량을 측정할 수 있습니다.You can use the third-party tool Azure Speed Test app to help gauge what your throughput is. 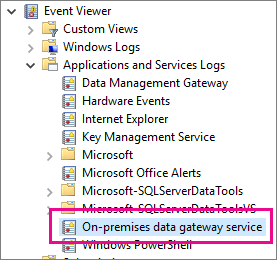 질문: Azure Active Directory 계정으로 게이트웨이 Windows 서비스를 실행할 수 있습니까?Question: Can the gateway Windows service run with an Azure Active Directory account? 답변: 아니요.Answer: No. Windows 서비스에는 유효한 Windows 계정이 있어야 합니다.The Windows service must have a valid Windows account. 기본적으로 서비스 SID, NT SERVICE\PBIEgwService로 실행됩니다.By default, it will run with the Service SID, NT SERVICE\PBIEgwService. 질문: 결과가 클라우드로 다시 전송되는 방법은 어떻게 되나요?Question: How are results sent back to the cloud? 답변: Azure Service Bus를 통해 수행됩니다.Answer: This is done by way of the Azure Service Bus. 자세한 내용은 작동 방법을 참조하세요.For more information, see how it works. 질문: 내 자격 증명은 어디에 저장되나요?Question: Where are my credentials stored? 답변: 데이터 원본에 대해 입력한 자격 증명은 게이트웨이 클라우드 서비스에 암호화되어 저장됩니다.Answer: The credentials that you enter for a data source are stored encrypted in the gateway cloud service. 자격 증명은 게이트웨이 온-프레미스에서 암호 해독됩니다.The credentials are decrypted at the gateway on-premises. 질문: 게이트웨이를 경계 네트워크(DMZ, 완충 영역 및 선별된 서브넷이라고도 함)에 배치할 수 있나요?Question: Can I place the gateway in a perimeter network (also known as DMZ, demilitarized zone, and screened subnet)? 답변: 게이트웨이는 데이터 원본에 연결되어야 합니다.Answer: The gateway requires connectivity to the data source. 데이터 원본이 경계 네트워크에 없는 경우 게이트웨이가 연결되지 못할 수 있습니다.If the data source isn't in your perimeter network, the gateway may not be able to connect to it. 예를 들어 SQL Server를 실행하는 컴퓨터가 경계 네트워크에 있지 않을 수 있으며 경계 네트워크에서 해당 컴퓨터에 연결할 수 없습니다.For example, the computer that's running SQL Server may not be in your perimeter network, and you can't connect to that computer from the perimeter network. 게이트웨이를 경계 네트워크에 배치한 경우 게이트웨이는 SQL Server를 실행 중인 컴퓨터에 연결할 수 없습니다.If you placed the gateway in your perimeter network, the gateway wouldn't be able to reach the computer that's running SQL Server. 질문: 게이트웨이로 고가용성 시나리오를 사용하기 위한 계획이 있나요?Question: Are there any plans for enabling high availability scenarios with the gateway? 대답: 2개 이상의 게이트웨이를 동일한 클러스터에 조인시키면 고가용성을 사용할 수 있습니다.Answer: High availability is enabled by joining 2 or more gateways into the same cluster. 고가용성 게이트웨이 클러스터를 사용하려면 온-프레미스 데이터 게이트웨이 2017년 11월 업데이트 이상이 필요합니다.High availability gateway clusters require the November 2017 update to on-premises data gateway, or later. 자세한 내용은 블로그 게시물 알림을 참조하세요.See the blog post announcement for more details. 질문: 재해 복구에 사용할 수 있는 옵션은 무엇인가요?Question: What options are available for disaster recovery? 답변: 게이트웨이를 복원 또는 이동하기 위해 복구 키를 사용할 수 있습니다.Answer: You can use the recovery key to restore or move a gateway. 게이트웨이 설치하는 경우 복구 키를 지정합니다.When you install the gateway, specify the recovery key. 질문: 복구 키의 장점은 무엇인가요?Question: What is the benefit of the recovery key? 답변: 재해 후 게이트웨이 설정을 마이그레이션하거나 복구하기 위한 방법을 제공합니다.Answer: It provides a way to migrate or recover your gateway settings after a disaster. 질문: 게이트웨이 로그는 어디에 있나요?Question: Where are the gateway logs? 답변: 이 항목의 뒷부분에서 도구를 참조하세요.Answer: See Tools later in this topic. 질문: 온-프레미스 데이터 원본에 전송된 쿼리는 어떻게 볼 수 있나요?Question: How can I see what queries are being sent to the on-premises data source? 답변: 전송되는 쿼리를 포함하는 쿼리 추적을 사용할 수 있습니다.Answer: You can enable query tracing, which will include the queries being sent. 문제 해결이 완료되면 원래 값으로 다시 변경해야 합니다.Remember to change it back to the original value when done troubleshooting. 쿼리 추적을 사용된 상태로 두면 로그가 더 커질 수 있습니다.Leaving query tracing enabled will cause the logs to be larger. 데이터 원본에 쿼리 추적을 위해 포함된 도구를 볼 수도 있습니다.You can also look at tools that your data source has for tracing queries. 예를 들어 SQL Server 및 Analysis Services용 확장 이벤트 또는 SQL 프로파일러를 사용할 수 있습니다.For example, you can use Extended Events or SQL Profiler for SQL Server and Analysis Services. 클라우드 서비스는 데이터 원본에 대해 암호화된 자격 증명과 함께 쿼리를 만들고 게이트웨이가 처리할 수 있도록 쿼리를 큐에 보냅니다.The cloud service creates a query, along with the encrypted credentials for the data source, and sends the query to the queue for the gateway to process. 게이트웨이 클라우드 서비스는 쿼리를 분석하고 요청을 Azure Service Bus로 푸시합니다.The gateway cloud service analyzes the query and pushes the request to the Azure Service Bus. 온-프레미스 데이터 게이트웨이는 대기 중인 요청에 대해 Azure Service Bus를 폴링합니다.The on-premises data gateway polls the Azure Service Bus for pending requests. 게이트웨이는 쿼리를 가져와서 자격 증명을 암호 해독하고 해당 자격 증명을 사용하여 데이터 원본에 연결합니다.The gateway gets the query, decrypts the credentials, and connects to the data source(s) with those credentials. 게이트웨이는 실행을 위해 쿼리를 데이터 원본으로 보냅니다.The gateway sends the query to the data source for execution. 결과는 데이터 원본에서 게이트웨이로 다시 전송된 후 클라우드로 전송됩니다.The results are sent from the data source back to the gateway and then onto the cloud service. 그런 다음 서비스에서 결과를 사용합니다.The service then uses the results. 게이트웨이 버전이 만료되면 많은 문제가 발생할 수 있습니다.A lot of issues can surface when the gateway version is out of date. 최신 버전을 사용 중인지 확인하는 것이 가장 좋습니다.It is a good general practice to make sure you are on the latest version. 한 달 이상 게이트웨이를 업데이트하지 않은 경우 최신 버전의 게이트웨이를 설치하고 문제를 재현할 수 있는지 확인하는 것이 좋습니다.If you haven't updated the gateway for a month, or longer, you may want to consider installing the latest version of the gateway and see if you can reproduce the issue. 지원되지 않는 도메인 컨트롤러에 게이트웨이 설치하려는 경우 이 오류가 발생할 수 있습니다.You may receive this error if you are trying to install the gateway on a domain controller, which isn't supported. 도메인 컨트롤러가 아닌 컴퓨터에 게이트웨이를 배포해야 합니다.You'll need to deploy the gateway on a machine that isn't a domain controller. 게이트웨이에 대한 여러 로그를 수집할 수 있습니다.You can collect several logs for the gateway. 항상 로그로 시작합니다!Always start with the logs! 온-프레미스 데이터 게이트웨이 서비스 이벤트 로그는 응용 프로그램 및 서비스 로그 아래에 있습니다.The On-premises data gateway service event logs are present under Applications and Services Logs. Fiddler는 HTTP 트래픽을 모니터링하는 Telerik의 무료 도구입니다.Fiddler is a free tool from Telerik that monitors HTTP traffic. 클라이언트 컴퓨터에서 Power BI 서비스를 사용하여 앞뒤로 볼 수 있습니다.You can see the back and forth with the Power BI service from the client machine. 오류 및 기타 관련된 정보를 표시할 수 있습니다.This may show errors and other related information.